The fingerprints I’ve chosen for the Finding the Fingerprints of God series are not arbitrary. These fingerprints represent some of the most concrete evidences outside the Bible for the existence of God. They illustrate some of the ways in which science demonstrates that belief in God is both rational and logical. Meyer added a category that I have not covered yet: human consciousness. Our capacity for self-reflection, creativity, morality, language, etc. supports the Judeo-Christian view that we are more than our material bodies. When I did this series of activities with our kids, I wanted them to understand the evidences for God in General Revelation as a ‘set’. I hung the picture at the beginning of this post on the wall near our kitchen table and over the course of a few weeks we slowly added each of the fingerprints as we discovered them through the activities I’ve shared with you. Unveiling the activities in this way illustrated to our kids that all of the fingerprints worked together and told us different things about God. Plus, it created some curiosity about what the next fingerprints would be. I would love to know if you have found this series useful! I will share some bonus fingerprints with you in the next few posts. 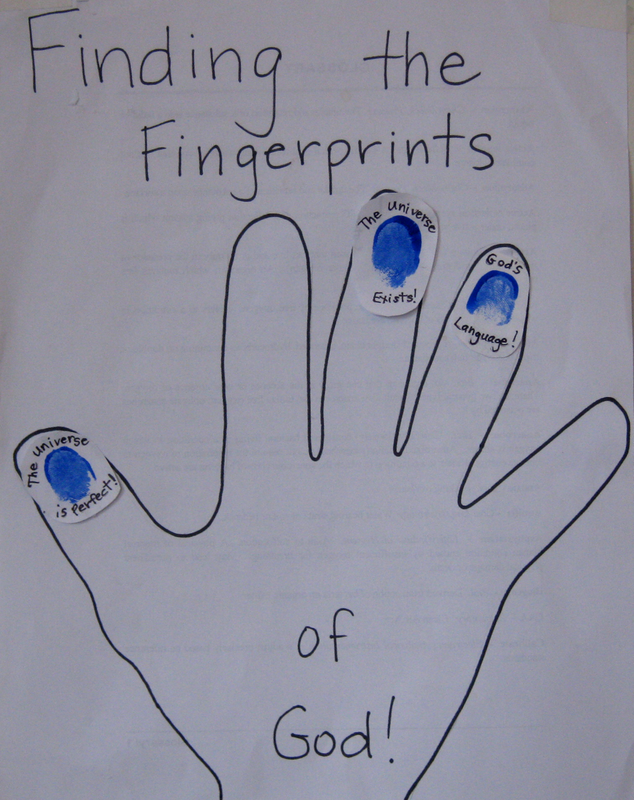 ← Fingerprint #5: God’s Language! For years we have been using science to support the Bible with our youth group. This has helped focus some of those thoughts. So, yes, this series has been useful! Thanks! Thanks for writing back! Good for you for bringing since into your youth group teaching. I’d love to know more about what you’ve done it you are interested in sharing it.